Whit Stillman and Jane Austen are a match as well-made as any in one of Austen’s books. And Austen’s novella, Lady Susan — probably her least-appreciated piece of work; this is the first time it’s ever been adapted to film — proves to be especially fruitful material for Stillman. His dry sense and cutting sensibility are suited to the meaner edge this story has in comparison with the rest of Austen’s oeuvre. In contrast to the usual Austen heroine, namesake Lady Susan Vernon (Kate Beckinsale) is middle-aged and decidedly darker in outlook and intent. Not long after her husband’s death, she seeks a new husband for herself and one for her daughter, Frederica (Morfydd Clark), in order to avoid poverty. To this end, she employs all manner of secretive scheming, social backstabbing, and bald-faced lies, all while continually insulting every person around her. She’s rather delightful, and Beckinsale carries her vicious intelligence and unwavering self-possession with perfectly calculated primness. Circling around Lady Susan is an at-first-disorienting network of characters. There’s Frederica; her sister-in-law, Catherine (Emma Greenwell); her only friend and confidant, Alicia Johnson (Chloe Sevigny); her targeted suitor (and Catherine’s brother), Reginald DeCourcy (Xavier Samuel); Frederica’s suitor, Sir James Martin (Tom Bennett); and Alicia’s unnamed husband (Stephen Fry). And that’s before getting to Lady Susan’s married paramour, his wife, Catherine’s husband and parents, and so on and so forth. The plot tosses varying combinations of all these people together to see what joy it can yield from them. Stillman and Austen share a delight in the “comedy of ill-manners” here, having fun with the characters constantly seeking to one-up each other’s undercutting comments or silly personality tics. Far and away the best of the supporting ensemble is Bennett, who deserves special mention for carrying Sir James straight into the canon of magnificent cinematic doofuses. He’s an endlessly chipper fellow fascinated by peas, thinks there are 12 commandments, and doesn’t understand how an estate called “Churchill” has neither a church nor a hill. Bennett’s live-action, British Ralph Wiggum routine is a treat every time he appears onscreen. Stillman continues to indulge his playful side here, even though there’s no single moment quite like the musical end to Damsels in Distress. Characters are introduced via intertitles, in the manner of old silents. Letters read aloud are displayed in text onscreen, visualizing the readers’ mindsets at the time. Such touches are weirdly sporadic, though; I honestly wish the film had gone even further and employed more presentational waggishness. 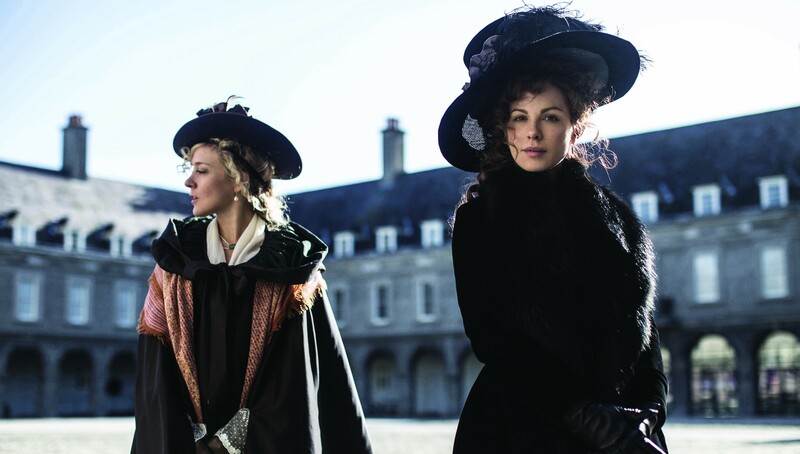 Love & Friendship premiered at the 2016 Sundance Film Festival and opens on May 13th.